ANY TREE $25. All Balsam Fir. Brush available. Walk the trails, share hot chocolate and cookies in the camp or by the fire with Santa's Elf! 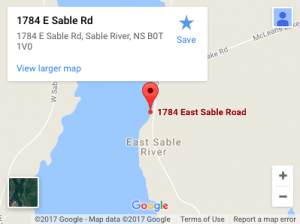 Take Hwy 103 to Sable River, turn on East Sable River Road for 8.3 km, left on MacLean's Lake Road, 2 km to top of hill - sign will be on the right to drive in gate.